The STEPU peripheral controls the step rate, direction, and target step count of a unipolar stepper motor. You can incrementally add counts to the target step count. The unipolar stepper motor controller controls the on/off state and direction of four open-drain drivers connected to the coils of a unipolar stepper motor. 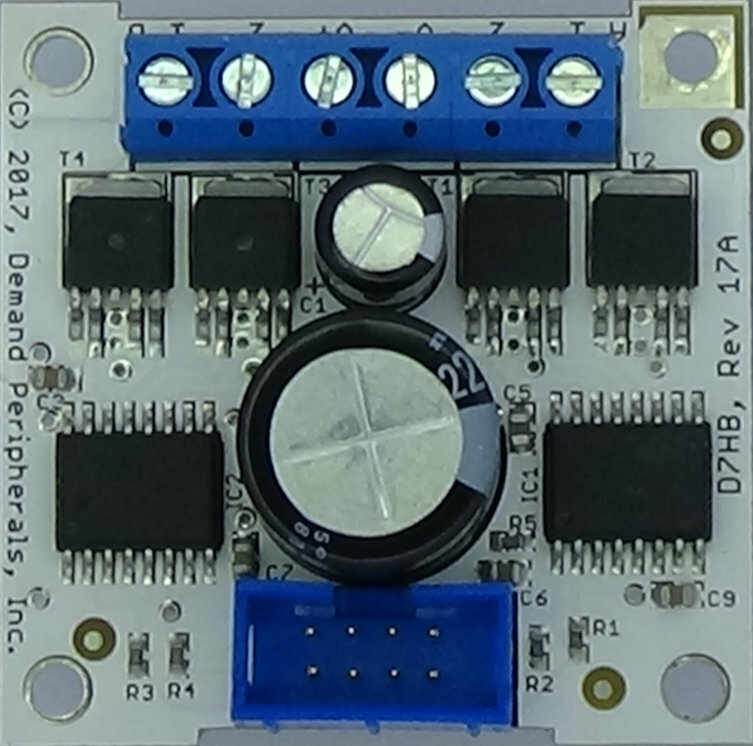 The STEPU peripheral is most often paired with DRV4, the quad open-drain driver card. More information about the DRV4 card can be found here: cards/drv4.html. Resources for the unipolar stepper motor controller let you control direction, step rate, and select either full or half steps. Three modes of operation are available: off, full-step, and half-step. The mode is specified as one of the words 'off', 'full', or 'half'. The first letter of each word can also be used. The off mode removes all power to the drivers. The power on default mode is off. The direction is given as 'forward' for a step sequence of ABCD and 'reverse' for a sequence of DCBA. The single letters 'f' and 'r' can also be used. The default is forward. The motor step rate is given in Hertz. The driver tries to use a step-rate as close as possible to the one specified. For example, a requested step-rate of 511 Hertz might result in an actual step rate of 500 Hertz. The step rate has 8 bits of accuracy, and a range from 4 Hertz to 1 MHz. The holding current is given as a percentage of full current and is in the range 0 to 99 percent. count : target step count. The count resource specifies the number counts. Is is entered as a unsigned decimal number in the range of 0 to 4095. This is a read/write resource. Setting this to zero stops the motor but leaves the coils energized. This value is decremented by one for each step (or half step) taken. The motor stops when the count reaches zero. A read of count show how many steps remain to be taken but be aware that latency in reading the value from the board means that the actual steps remaining are probably fewer that what is reported. addcount : synchronously add counts to target. The addcount resource is an unsigned decimal number in the range of 0 to 4095 that is added to the target count. The addition is done in the FPGA so that the addition is synchronous to the steps. Addcount is needed for accurate movement when the target number of steps is larger than 4095. For example, to accurately step out 6000 steps, you would write 4000 to count, and then some time later write 2000 to addcount. This is a write-only resource. Step in the forward direction for 200 full steps at a step rate of 40 steps per second and use a holding current of 10 percent of full power.